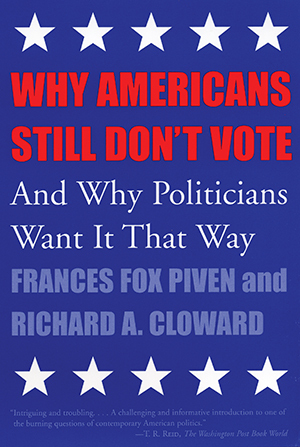 Frances Fox Piven and Richard A. Cloward were key players in the long battle to reform voter registration laws that finally resulted in the National Voter Registration Act of 1993 (also known as the Motor Voter law). When Why Americans Don’t Vote was first published in 1988, this battle was still raging, and their book was a fiery salvo. It demonstrated that the twentieth century had witnessed a concerted effort to restrict voting by immigrants and blacks through a combination of poll taxes, literacy tests, and unwieldy voter registration requirements. Why Americans Still Don’t Vote brings the story up to the present. Analyzing the results of voter registration reform, and drawing compelling historical parallels, Piven and Cloward reveal why neither of the major parties has tried to appeal to the interests of the newly registered-and thus why Americans still don’t vote.